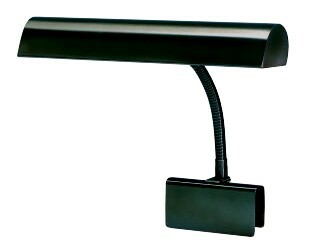 8 1/2" goose-neck adjustable arm and swiveling shade. CLAMP: 2 1/2" x 5 1/2"
*T10/F is the model number of the bulb required. The "T" refers to the tubular shape of the bulb, and the "F" means that the bulb is frosted. These bulbs are very common, and are readily available wherever lightbulbs are sold. Superior handcrafted piano lamp, made in Vermont by House of Troy - theirs are the very best piano lamps in the industry. payable upon delivery, that are associated with the purchase. Shipping, however, is still free. Copyright © 2001-2019 Concert Pitch Piano Services. All Rights Reserved.